Crocodilians have the ability to swallow prey under water: The palatal valve, in the back of a crocodilian’s mouth, is a unique adaptation that seals the throat off from both air and water. With the palatal valve shut a crocodilian can grasp food underwater and not have the water flood past into the esophagus or glottis. Essentially the inside of a crocodilian’s mouth is outside its body. Crocodilians obviously prefer to keep this palatal valve closed while submerged, and come to the surface to swallow their food, thus avoiding water rushing past the palatal valve. 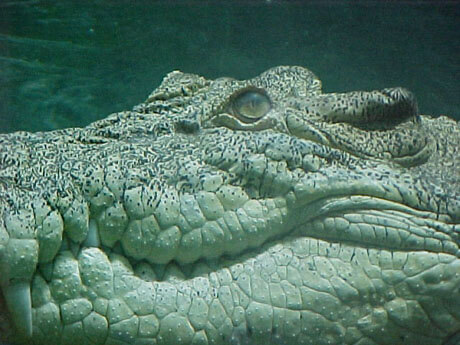 It is often assumed that crocodilians are unable to swallow food underwater. However, we have witnessed three crocodilian species swallowing their food underwater. The first is a female Freshwater crocodile, Crocodylus johnsoni, housed alone. On several occasions she has picked up pieces of meat from the bottom of the pool and proceeded to eat them without surfacing. Once this behavior was noticed, it became a regular observation. The second observation is of a female saltwater crocodile, Crocodylus porosus, housed with its mate. This female swallows both above the water and below, seeming to not have any preference for one over the other. When she surfaces, after swallowing underwater, she has been observed purging excess water at the surface. This appears to be done by contracting muscles in the throat. Water can be seen spraying out of the mouth from the palatal valve. The third species we have observed swallowing underwater is a female false gavial, Tomistoma schlegelii. She is currently housed in a large exhibit with another female and a male. This exhibit affords visitors a complete underwater view of the entire pool through four large glass panels. Soon after moving the female to this exhibit, I witnessed her taking a piece of meat to the bottom of the pool and holding it. After about five minutes, she very deliberately partially opened her mouth, then opened her palatal valve, and quickly moved her head forward and swallowed the meat. She remained in a resting position on the bottom of the pool for another ten minutes. Because she had recently come to us from Audubon zoo, I called the reptile staff there and asked if they had witnessed this behavior. They said that they had. Apparently the male Tomistoma at this facility was in the habit of stealing the female’s food if she surfaced with it. I have witnessed her swallowing underwater on only one other occasion. I believe the behavior is being extinguished by our training efforts, as our male does not have an opportunity to steal meat from the females.